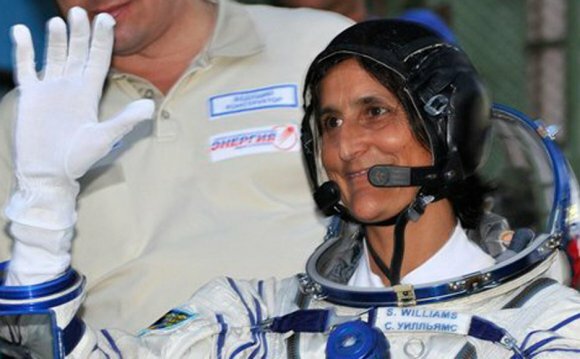 Sunita Williams, in full Sunita Lyn Williams, née, Euclid, Ohio, U.S.), American astronaut who holds the record for most time spent on space walks by a woman. In 1983 Williams entered the U.S. Naval Academy at Annapolis, Maryland. She was made an ensign in 1987 and reported for aviator training at the Naval Aviation Training Command. In July 1989 she began combat helicopter training. She flew in helicopter support squadrons during the preparations for the Persian Gulf War and the establishment of no-fly zones over Kurdish areas of Iraq, as well as in relief missions during Hurricane Andrew in 1992 in Miami. In 1993 she became a naval test pilot, and she later became a test pilot instructor, flying more than 30 different aircraft and logging more than 2, 770 flight hours. When selected for the astronaut program, she was stationed aboard the USS Saipan. Williams completed an M.S. in engineering management from the Florida Institute of Technology in Melbourne in 1995, and she entered astronaut training in 1998. She traveled to Moscow, where she received training in robotics and other International Space Station (ISS) operational technologies while working with the Russian Federal Space Agency and with crews preparing for expeditions to the ISS. Williams, SunitaNASAOn December 9, 2006, Williams flew aboard the space shuttle on the STS-116 mission to the ISS, where she was a flight engineer for Expeditions 14 and 15. During her stay at the space station, she made four space walks, totaling more than 29 hours outside the spacecraft, and spent a total of more than 195 days in space, both of which were records for women in space. (She held the latter record until 2015, when Italian astronaut Samantha Cristoforetti spent more than 199 days in space.) She also participated in the Boston Marathon by running 42.2 km (26.2 miles) on the station’s treadmill. She was the second American astronaut of Indian heritage to go into space, after Kalpana Chawla, who died in the Columbia disaster. Williams landed at Edwards Air Force Base in California with the crew of STS-117 on June 22, 2007. Sidney McNeill "Sid" Gutierrez (Colonel, USAF, Ret.) (born June 27, 1951), is a former NASA astronaut.